Last weekend I managed to combine a work trip and bike ride. I did the Double Triple Bypass. I combined the ride with some charity fundraising, so a big thanks to all that contributed. 1350 pounds towards Cancer Research in memory of Hamish. You can still donate! Before I go into details about the ride, I need to say thanks to a number of people. to my long suffering family who have endured my training and preoccupation with dropping that bit of weight for weeks. to Mike, Juergen and Graeme, who, in various ways, have helped me get and stay in shape. to Wheat ridge Cyclery for the bike rental: a sweet Specialized Roubaix. to Joel and family for the overnight stay in Vail. to the Hilton Garden Inn in Denver, who went the extra mile. to my management and clients who made the business side of the trip happen. To the organizers, volunteers and local police force. The ride is 120 miles ( 193 kms) from Evergreen (Bergen Park) to Avon over Juniper Pass (11,140 ft.) (3390 m), Loveland Pass (11,990 ft.) (3654m), Swan Mountain and Vail Pass (10,560 ft.) (3218m). 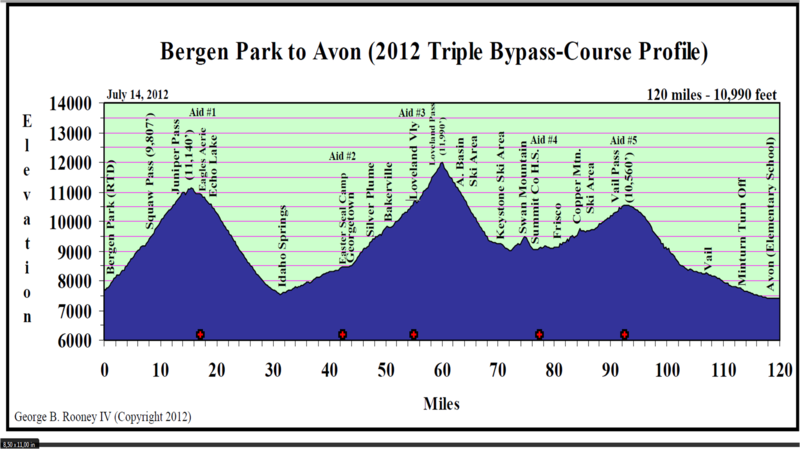 There is over 10,000 feet (3000 m) of climbing. details here on mapmyride. I got to the start early, and picked up my number. I headed out at about 5.40am, and watched the sunrise as I rode up the first pass. The climb to Juniper was long and steady, at least 20 kms of climbing. The gradient never really got steep, although towards the end it did get harder. This was probably due to the altitude rather than the road. I focused on riding exactly on my heart rate anerobic threshold, and I didnt worry about the steady stream riding past me. I hung out with Ned, a geologist, who had done the event several times. At the top there was a well stocked food and drink stop. The descent was super, nice wide road in pretty good condition. I was able to pass quite a few people on the descent. My lack of speedometer probably meant I went a bit faster than I usually do. The roubaix handling is very comfortable, and gave me a lot of confidence. After coasting through Idaho springs, I began the gradual climb through Georgetown,Sliver plume, Bakerville towards Loveland pass. The ride moved off the main road onto a bike path. This was lovely, as it meant no traffic and a lot of nature. I rode a fair bit of this section with Andy, who was doing his 10th ride. After another stop, I then did the climb up to Loveland. The last 6 miles of this climb were pretty tough.The gradient is a bit more alpine like much less forgiving. Also the lack of shade reminded me of the the second half of Tourmalet. The 27 cassette came in handy. 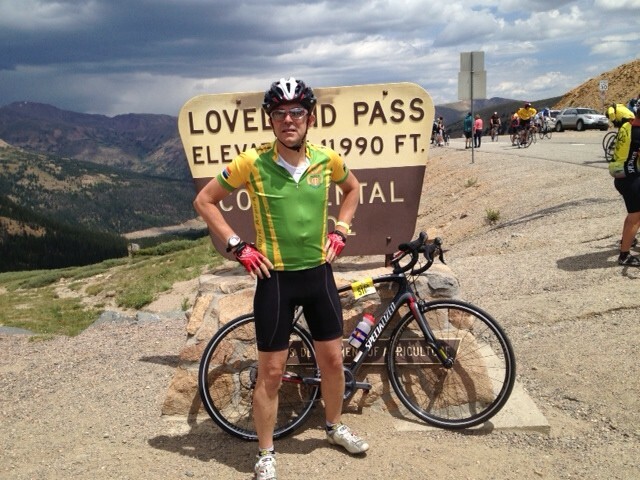 Loveland is on the continental divide, and is the highest point of the ride. The descent was fast, as the first part was on the main road. Very few cars, thanks to the work of the organizers. The next rest stop was in Keystone. There is a nasty little climb that they forgot to tell me about. Swan mountain. It is short, but I didn’t expect it to hurt as much as it did. The ride from Frisco up to the top of Vail pass was a gentle, winding climb along a bike path, for the best part of 20 miles (38kms). Despite the gentle gradient I was riding in the easy gear. It rained a bit between Frisco and Vail pass, but nothing heavy. The descent to the finish was a mix of bike trail and main road. The road was in mixed condition, but I descended as fast as I could anyway. Close to Vail town the clouds opened and it poured down with rain. The last 10 miles or so, although a gentle downhill were pretty miserable. I was really pleased to get into the finish and hook up with Joel and Dale. They were both quicker than me by a considerable margin. According to the polar I used 6832 Kcal. I think I averaged 22km/h for the day. After a quick bike to eat, we headed to the condo and the hottub.The pizza for dinner didn’t touch sides. Next morning we woke early and headed out from the condo. The rain had cleared. The climb up to Vail pass wasn’t as bad as I had expected. I didn’t spend much time at the rest stops on the second day, as I figured that it might rain again. Loveland was equally tough as on the first day, started off easy and then got nasty near the top. Descent was brilliant. I should ride without a speedometer more often. For the section between Loveland and the base of Juniper pass I managed to get on the back of a larger group. I lurked at the back, doing as little as possible time at the front. Nevertheless, by the time I got to Idaho springs my legs weren’t happy campers. I was worried about the last climb, as I was now pretty beat. I got into a comfortable gear and plodded on up. The climb was long, roughly 20 miles, but it never really got steep. I did stop to look at the view (nudge nudge) The last three miles near the top is a bit frustrating as there are a couple of false summits. It drizzled a bit on the way up, but that wasn’t really an issue. The descent to the finish was great, but parts of the road weren’t in great condition. The rain held off. Weirdly, I was quicker on day two than day one. The welcome at the finish was noisy, lots of folks clapping. 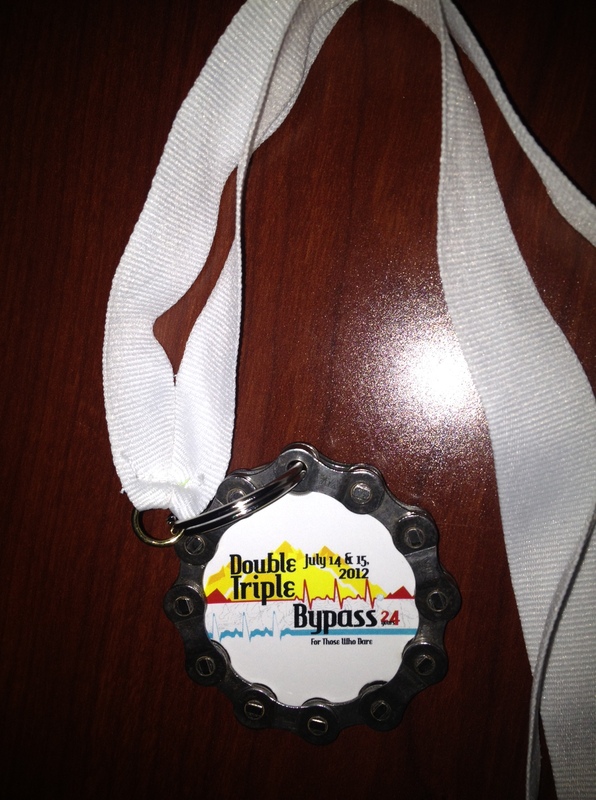 I picked up the medal and dashed back to Denver to drop the bike off. Thanks again to all that made this possible. A really memorable event. Very well run. I hope to be back. Author Thomas OtterPosted on July 26, 2012 Categories charity, Cycling relatedTags cancer, cycling, loveland pass, ride, rockies, triple bypass, vail pass10 Comments on Double Triple Bypass review.